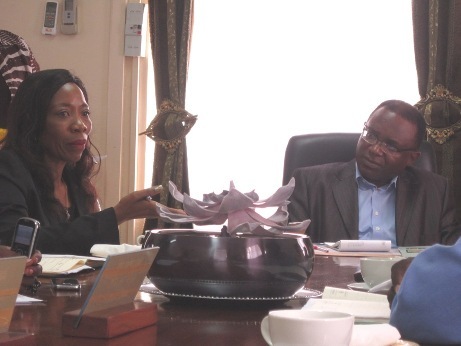 The High Commissioner of the Republic of South Africa, Her Excellency Madam Zanela Makina, visited the Cameroon Development Corporation (CDC) on Thursday October 3rd, 2013. Madam Makina who took up office in Yaoundé in March, 2013 was visiting the Corporation for the first time. Worth mentioning is that on Monday, 1st October, 2011 the High Commissioner of Cameroon to South Africa, His Excellency Mr. Adrien Kwambo led a delegation of South African investors to visit the CDC. Her Excellency Madam Makina was visiting on the heels of these earlier contacts to examine with CDC Management, possible areas of co-operation between her country and the CDC. The General Manager of CDC, Franklin Ngoni Njie was accompanied in the discussion by Acting Director of Plan and Development, Mr. Dissoh Hell and Chargé d’Etudes, Dr. Stephen Namijo. Both parties established that South Africa was an advanced food processing industry that the CDC could benefit from especially, in the areas of fruit juice production, cereal production and food conservation. The possibilities of procuring agricultural machinery and agrochemicals (fertilizers, herbicides etc) from South Africa were also discussed. The High Commissioner promised to use her office to help establish contact between the CDC and potential partners in South Africa.